A Florida Monarch Pig'Pillar basking in the noonday sun. After lunch, he ate all the leaves on this plant and had started on the one next door by nightfall. In the morning, he ate the tires off our car and was eyeing over the cat when ... just kidding! You do know I'm just kidding don't you? 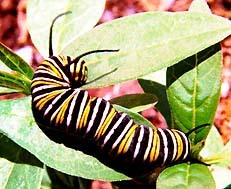 The Monarch only consumes milkweed. The cat, car tires, and all your other plants are safe from this munching machine. If they run out of food, they'll starve to death in a jungle of lush foilage. It happens all the time. The milkweed plant does not grow fast enough to replentish the leaves necessary to maintain a constant regeneration of butterflies. Like the wildebeest, the Monarch migrates in search of greener pastures, and those trailing at the end of the herd don't always make it. Copyright © 1996, Dale A. McClung. All rights reserved.